As you know, Paris is known for its brasseries and above all, its « terrasses », and you can not walk on a street without bumping into at least one brasserie. Here, at ParisByM, we have prepared a top 5 of the best brasseries in Paris. Don’t miss out those ones, which were (and are currently) famous for their history and menus (classification is neither increasing nor decreasing). 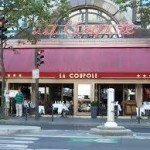 In the neighborhood of Montparnasse (14th district), the brasserie La Coupole is an emblematic and artistic place of Paris. At la Coupole, you can enjoy breakfast, lunch, and dinner at prices varying from €11.90 to €59.00. What is better than eating well, feeling the artistic atmosphere of the place, in the heart of Paris? Founded in 1927, this brasserie has directly become a great success and personalities and artists such as Jean Cocteau, Man Ray, Georges Braque, Brassaï, Picasso, Edith Piaf, and even Ernest Hemingway, were regular customers.The artistic legacy of the place is also defined by the numerous interventions of artists who came to add color to the famous “pillars” of the restaurant and to paint. This brasserie is particularly frequented, especially by those who want to regain the atmosphere of the book “Paris est une fête” written by Hemingway .. You can click here for more information. Classified as a historical monument, there is no doubt that Le Bouillon Chartier is a must among the best brasseries in Paris. Created in 1896, it has kept the same architecture of the XIXth century. It is a landmark in the history of Parisian brasseries. Everything has remained faithful, even the prices: the main course do not exceed €13,50 (from €8,50), the entries range from €1,80 to €6,80, and the desserts €2.20 to €4.00. Click here to check their website. Le Bon Bock is the oldest brasserie in the artistic and very parisian neighborhood of Montmartre. Also here, the greatest artistic figures such as Picasso or Apollinaire came to have a drink in this brasserie created in 1879. The prices are quite reasonable for a big parisian and historical brasserie, such as for example the starter Gratinée de Mamie à l’Oignon for 6,80 €. Find all the information here. This brasserie serving traditional food is leveled on three floors, in the middle of which you can admire a patio of plants, open sky over Paris. 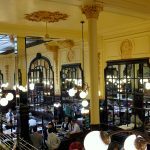 Le Café du Commerce was founded in 1921 and is one of the most trendy and best brasseries in Paris of the XXth century, just like the Bouillon Chartier. The formula Main course + Dessert + Coffee at 17.50 € largely worth it! Check the menus here. This traditionnal brasserie located in the Latin Quarter (6th district) is a place full of history. Created in 1890, it welcomed street artists and very known writers, such as Paul Verlaine or Victor Hugo, the author of the Hunchback Of Notre Dame, who was a regular customer. The meetings of the Collège de Pataphysique were organized here in the 1950s. If you do not have to miss one of the best Parisian brasseries, this is THE one. There is something for every taste, from the classic « oeuf-mayo » (egg mayonnaise), to the blanquette de veau, or beautiful entrecôtes. More information on their website.